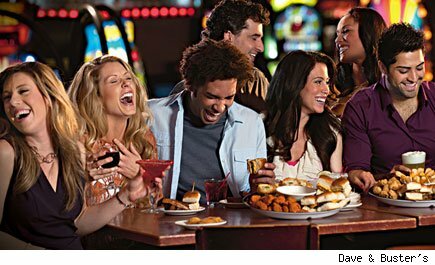 When Dave & Buster's Comes Out to (PLAY), Will Investors Win? A blast from the past should be trading again by the end of the week. Dave & Buster's -- the 60-unit chain featuring lively arcade games and casual dining -- plans to price its IPO on Thursday night and begin trading on Friday. The concept that's often summed up as a Chuck E. Cheese (CEC) for adults will trade under the appropriate ticker symbol (PLAY). With a little more than 27 million shares outstanding after the IPO, Dave & Buster's will command a market cap of roughly $350 million if it prices at the midpoint of its expected price range of $12 to $14 per share. Is that too much to pay? Or is it a bargain? Swipe your Dave & Buster's card. It's time to play. The Dave & Buster's business model sounds great on paper. The average location checks in at a whopping 47,000 square feet. And the typical store rings up nearly $10 million annually. The "Midway" component features ticket redemption games, video games, as well as throwback games such as billiards and shuffleboard. The entertainment features generate half of the company's revenue. Yes, they take up far more space than the actual bar and restaurant, but this is the element of Dave & Buster's business that sets it apart from conventional eateries. Perhaps more importantly, gross margins on the entertainment side check in at a healthy 85%. Each of the 52 locations that have been open for at least a year was cash flow positive, but potential buyers will be shocked by the income statement. Dave & Buster's has posted a loss in each of the three prior years. The company has been able to ring up an operating profit in each of those years, but the heavy burden of interest debt turned black ink into red ink. The IPO will naturally help eat into that mounting debt. The upside here is that Dave & Buster's did post a profit through the first six months of this fiscal year which ends in late January. Yes, Dave & Buster's was publicly publicly traded before, back when themed restaurants including Planet Hollywood and Rainforest Cafe were popular with investors. Then things began to fall apart. Planet Hollywood filed for bankruptcy reorganization. Rainforest Cafe was acquired by seafood chain Landry's. And Dave & Buster's was taken private in 2006. The stock will trade at a reasonable price-to-sales multiple, but the lack of consistent profitability will scare away typical restaurant investors that prefer profitable expansion. It's their loss. Investors that can appreciate a public Dave & Buster's ability to use equity to pay down its debt and expand into smaller markets with smaller restaurants will be able to get an attractive price on a growing company. All of this summer's restaurant IPOs -- Chuy's (CHUY), Del Frisco's (DFRG), and Outback Steakhouse parent Bloomin' Brands (BLMN) -- are currently trading well above their debut prices. This bodes well for Dave & Buster's on Friday. Motley Fool contributor Rick Munarriz does not own shares in any of the stocks in this article. Motley Fool newsletter services have recommended buying shares of CEC Entertainment.